Club Penguin Cheats by Mimo777 Club Penguin Cheats by Mimo777: Club Penguin Coins for Change and Iggy Winners! UPDATE! Club Penguin Coins for Change and Iggy Winners! UPDATE! CLICK HERE TO WATCH THE CLUB PENGUIN COINS FOR CHANGE RESULTS VIDEO! It was really close this year! 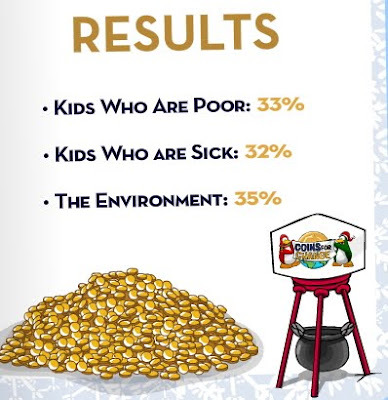 I am a bit surprised the environment would get more coins than the sick kids. Come on! Their sick, they need help now! Wow! Congrats to all the wieners! 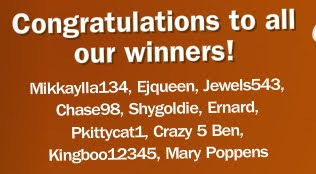 Check back next week for 20 more winners! Last, but not least, if you are out looking for Aunt Artic, you will most likely find her in the Sleigh Ride! PLAY FRAGGER! Best Flash game eva! people reproduce like 5times faster than any animal. ANimals need help because they will become extinct. Mimo i got all of the answers right on the little quiz thingamabob. why haven't you posted the winners for it yet? p.s:I am trying to be a mod! Dear hopegirl98 mimo did not post it yet because if u look at the post at the end it says i will post the wieners tommorow. that would be sooner today. He said that he was posting the weiners tomorrow! If you look at his post more closely you will see that he said he'll post them tomorrow. To all people who celebrate Christmas, Merry Christmas Eve! Peoples!!! i saw the post and i saw the thing at the bottom that said he will be posting tomorrow but i thought he had posted that yesterday which would mean he would and should have posted them today. Cool! I just need AA Rh and PB to complete my autoghraph collection. i dont know if anyone can remember this but do you remember the game that cp said would be in the forest and they had a sneak peak that had a penguin about to through a water balloon? i guess they just canceled making the game. Mimo is not showing the winners until tomorrow. 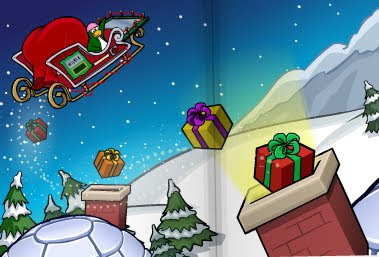 i had a good idea for a poll, it could say: "What do you think will be in the present at your igloo?" and you can put some random funny options. -----------------------------------You are soooo right. I don't want to die. Who does? ThE EnViRoMeNt RuLeS! Congrads. You have worked real hard and you desreve it. I hope you meet them. So what you are saying is that you dont care for yourself but animals more. Nevermind it is all about opinions. We are Mammals. I think the Enviorment did’nt need the most donations, because thats being done mostly by the goverment. Kids who are sick are being treated, I think Kids who are poor deserve most donations, because the cant even get a loaf of bread. winners one of those is my freind :D and i put all my coins to the sick to the poor may be sick but thaat means they will fall under the sick catagorie seriosly sic ppl could die! Forget the enviroment! Help the kids... What's wrong with you guys? I can't see them dying. but they r not talking about animals they r talking about the envirnment like ground and trees and grass and stuff the planet earth and all animals go to heaven it says it in the bible! to the One seated on the throne and to the Lamb, forever and ever! What's up with ClubPenguin? I looked at the old Clubpenguin Christmas cards and it said "Merry Christmas", I was happy with that, but now the Christmas cards say "Happy Christmas"??? This is the important part, if you celebrate the real meaning of Christmas you ARE a Christian. And, in the Bible it says that the Eviorment will not die because of man and it will not die. So why do we need the majority of this money to help animals intead of children who are dying!!!!! Animals have NO soul, humans DO! Thank you for reading this. Thanks, Hnwjanuary11! Merry Christmas to you, too! Yeah... I'm glad that each cause got pretty much the same amount! It was evened out, and that's all that matters. Each cause got a good portion of the vote. Animals go to Heaven because they never do anything wrong! In the Bible, it says that God's favorite creation of his was people... so that should be what is most important: Helping other people. Especially those less fortunate. Well done to the people who won this week! I personally think that we should not be talking about that subject now. Its total rediculas that the enviroment won. It is the least inportenet.I think the poor and sick kids should be helped first. It is the right thing to do instead of the enviroment. PS icebox9 no animals go to heaven. Heaven is only for humans. That's right! either the whole world dies, or everything but us and cockroaches die. But, i think i know why it was close this year. maybe everyone wanted to donate equally to everything. I remember that! maybe theyre still working on that. It kinda takes a long time to design a new game. Congratulations! I hope you get to meet them! well, he's right. humans produce much faster than the average animal. every 8 seconds a new child is born. if you voted for the envirnment you kinda for for the other things too. the biggest reason kids are sick is because of the pollution. hope that helps! God put animals on the planet for a reason. No one knows the reason but there is one. If we all went around saying "Who cares about animals?! Think about yourselves! ", then alot of things would go wrong. Animals do alot of things for us. Take bees for example- without bees then there would be no plants to give us oxygen. We need oxygen to live. Of course children are just as important but that doesn't mean that they deserve all the attention that animals don't get. Everything on this planet is here for a reason and we shouldn't treat it like it's trash. if there were no monkeys, there would be no us. humans evolved from monkeys. your right. honestly, i can't really decide which catergory should win. i think they should all win! Hey mimo! If you enter the sleigh, when it comes up saying" Loading Santa's Sleigh", it doesnt! It says loading the maze! Awsome glitch hmm. I so agree Hope131! all of them were really worthy and many penguins gave and that was good. All of them were important. Its almost like a food chain (except without food! )and you were also right because the bible says that no one knows the day or time the world will end except him! ANIMALS HAVE A SOUL! I think that animals are MUCH better than hummans. They are loyal, and they will always listen to you... Merry christmas! People didn't evolve from monkeys. That is ridiculous. I know that 98% of scientists say that humans evolved from monkeys, but if you really read about us, then you would know that we are nothing like monkeys. Humans are WAY WAY WAY too complex to evolve from something. Read into something before you go around telling the world how you feel. That's really awesome! I think that that is one of the better causes... Every 3 seconds a child under age 5 dies because they're sick. Mostly because of bacteria in the water they're have to drink. You should look up this organization called "Water Missions International." I heard about it through my church, it's super cool. Sorry to say that you're wrong, but you're wrong. Yes, if we don't act now, some animals WILL become extinct. But that really isn't in our hands, it's in God's hands. It says in the Bible that God will take care of the Earth, he won't let us completely destroy it. If the enviornment dies, then we wont have as much food for everyone. i think evry catagory should get enough money to feed the poor, give medicine to the sick, and plant trees for the enviornment. for your information, global warming has been proved by many legit universities and organizations such as Harvard and NASA. Global Warming is happening slowly; its not like it going to be 50 degrees one day and 100 degrees the next. And global warming is not cause just by humans; the environment contributes, too. Animals give off methane, a greenhouse gas. So whoever told you global warming is a "frod" not in tune with the world. I'm not surprised that the environment got more votes. Our eco-system is in need for the entire world. Sure sick children need help, but we all need help. It's not just food that would be lost. If the environment is wrecked too much, then the entire human race could be eliminated. (And I do not think global warming is to blame for any of this.) So when we pollute, we are really making it worse for ourselves. Awww yum i love them!! your soooo lucky!! Ive only ever met my aunt and uncle once, and that was 11 years ago :/ Have fun eating them!!! You said congrats to all the wieners. Good thing I didn't win or you would be called me a wiener. But when you are opening Christmas presents think of the children who are in a dirty bed sick, with no medicine. this is for iggy winners. its really not fair if only MEMBERS CAN JOIN, but if ur a nonmember u still can join but there is no chance of winning cuz all u have is a small iggy with a few puffles, and puffles dont even count. but at the same time it's kinda fair cuz the winners get coins and members need coins to buy things, and nonmembers dont need coins cuz of course they cant buy anything exept backrounds and puffle food which cost like nothing. but again its not fair cuz nonmembers wanna design their iggy and get their penguin name ON THE CP TIMES NEWSPAPER!!! and then again, memebers PAYED to do those and nonmembers didn't. but all the members are popular and get those dumb girlfriends and boyfriends, when nonmembers can't. also some parties are MEMBERS ONLY and if a nonmember goes in they will say to get out and if u dont they'll report u. overall, to nonmembers its not fair cuz they can't do anything but for members its fair cuz they payed for this. I agree, non-members do not have as many privlages. I am a member currently but I remember being a non-member. I never really enjoyed it... But if you really want to get your name in the newspaper, you could always submit a comic, joke, puzzle, or riddle. These won't get you coins if you get your name posted, but non-members don't need coins. But who really needs a boyfriend/girlfriend? Most of us are probably to young anyway. And it's pointless to walk up to some random penguin who you don't even know and make a heart sign! He/she could be some 23 year old person who lives in their parents basement! If you're smart you wouldn't do that. And to tell you the truth, club penguin doesn't bann everyone that gets reported. So if you get reported for walking into a member's igloo, you won't get banned. Technically any living that carries out the entire life cycle is part of the environment. So even humans are part of the environment. I'm not saying sick children aren't important. But if one kid dies then it's sad. But if the entire human race is eliminated, that that's devastating. If the environment is polluted too much, then we're in big trouble. Of course sick kids are very important but so is everyone else.